The 10 Best Candy Shops in Kansas! Whether it’s old-fashioned shops that date back over a century or homemade fudge that will send you to a chocolatey heaven, Kansas’ candy stores will please candy lovers of all palates. Here are the 10 best in the state! Its reported Pete Cero started Ceros Candies in 1885 in Wichita, and today customers are treated to the same great chocolate candies today. Stop by and treat yourself, and learn the history behind this famous candy shop. Studio Pink Candy Boutique located in the Fort Riley area is a great place to create your personal candy bouquet. This candy shop specializes in personalized candy bouquets, for any special occasion or just because! The fudge is “to-die-for” at The Fudge Factory, inside the Oswego Drug Store in Oswego. They offer family favorites, year-round fudge flavors, and seasonal fudge flavors, all sold by the square. Find delicious chocolate candy in a sweet candy store in Salina, called Sweet on You. 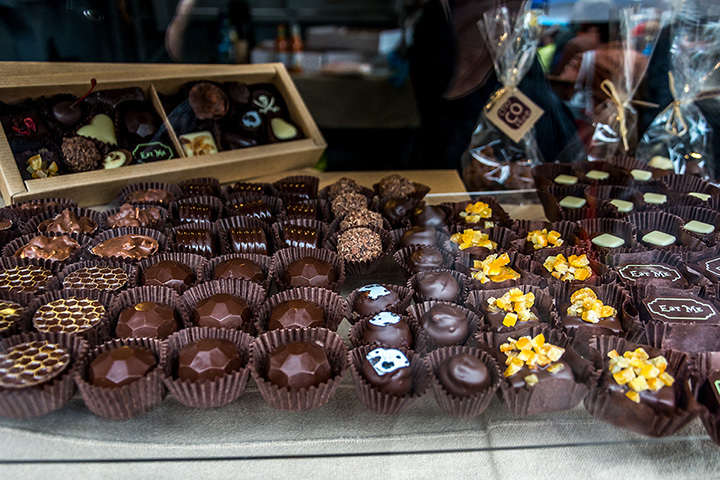 An assortment of chocolates, including dark chocolates and candies fill the shelves. Try one chocolate or sample them all, and find the sweet your sweet tooth is craving. A sweet neat little candy store with a huge selection of candies, The Farris Wheel Candy Company in Wichita is awesome. Stroll through the aisles of candies, and experience the look and feel of a genuine old-time candy store. Annedore’s is located in the Westwood Hills on the Kansas side of Kansas City. A Kansas City favorite for more than 25 years that is known for its indulgent chocolate treats. Stop in, and reward yourself with some of the finest European chocolates or pick up a unique chocolate gift for a special occasion. Dexter, Kansas is the home of a sweet little candy shop named Henry’s Candy Company. They offer a variety of candies and specialize in homemade candy made fresh and from scratch every day. Customers can watch the staff make candy while deciding what to take home and enjoy. Sweet Granada in Emporia includes a delicious variety of homemade gourmet chocolates and confectionaries. A unique place to drop in, choose a favorite sweet and indulge in chocolate bliss. Come and experience a chocolate lovers dream shop in Wichita at Chocolate Dolce. Rich in chocolates, history and traditions, this is the place to slow down, taste fine chocolates, drink exquisite coffees, wines and enjoy the atmosphere.